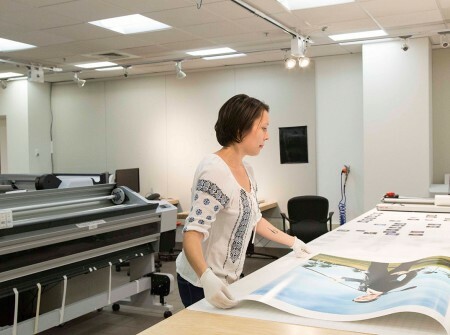 We offer high-quality archival pigment printing and drum scanning at affordable prices and dedicated turnaround times for artists, museums, galleries, and institutions both near and far. Our services include color-managed, museum quality printing onto a wide variety of papers, fabrics, and films. Our master digital printmakers work closely with artists to ensure the best possible quality. In addition, we offer high-resolution scanning and retouching services for all film formats. We offer convenient online invoice payment, free and secure job file archiving, and a vast 50 years of combined experience in the digital output world. Have questions or want to place an order? Light Work Lab is a membership-supported operation. We offer a Service Lab Membership that gives you access to high-quality printing, scanning, and editing services through the lab. Before proceeding with an order, please be sure that your membership is current. For information about membership and pricing, click here. Questions? Do not hesitate to ask. You can submit your files to us through the Light Work Upload Server. We print artist work on premium fiber or photo-weight papers using our Epson 11880, 9900, and 4900 printers. Maximum width for most of our media is 60 inches. Use the following chart to estimate the cost of common print sizes. Final cost is subject to a quote, if requested, and is determined by square inch. Prints are always billed by final paper size, using the following calculation: (Height x Width) x (Sq. in. price) = Cost of print. * Single prints are billed at full price. 2+ prints of the same image receive 20% discount. If proofs are requested, they will be billed according to cost of chosen paper and receive a 20% discount. Stocked Premium Fiber Papers: Canson Platine Fibre Rag 310gsm, Canson Edition Etching Rag 310gsm,Canson Baryta Photographique 310gsm, Canson Rag Photographique 310gsm. Stocked Photo Weight Papers: Epson Premium Luster 260gsm, Lexjet E-Satin 300gsm, Hahnemühle Photo Matt Fibre 200gsm. We scan and retouch film up to 5 x 7 inches on our Hasselblad Flextight X1, film up to 8 x 10 on our drum scanner, and prints up to 11 x 17 inches on our Epson 11000xl scanner. All of our scanning services include RGB 16bit TIF files of the original made at or above the optical resolution of the scanner and sent to the client digitally. Dusting on Flextight, Flatbed, and Drum scans is billed at the hourly labor rate of $40/hr. Because we work with leading photographers from all over the world as part of Light Work’s Artist-in-Residence program, we have skill in retouching a wide variety of photo work. From simple dust-busting, advanced color-matching, to complex body-retouching and scene compositing, we have you covered. We are primarily a fine-art print-lab, however. Large commercial studio-retouch jobs that are not being printed in our lab may be declined as we want to preserve our time and knowledge for working artists. One type of retouching we do a lot for artists is color-correction and pre-press work for books. We have decades of experience on-press with our Contact Sheet publication and we offer that knowledge and skill to artists who are going through the bookmaking experience. We generally help produce about 5-10 books per year and are very proud of those projects. Print trimming, scan retouching, color correction, dusting, AP-matching, and other labor are billed at $40 per hour. Print file setup labor (the first 15 minutes) and minimal trimming is free. We archive client print files both locally and encrypted off-site. While we offer this unique service for all print jobs, please do not rely on the lab as a recovery option for lost files. We encourage you to develop a system for the safe keeping of your own files. Turn-around times are generally 72 hours, however large jobs may be longer. The client must bear responsibility to schedule their work sufficiently ahead of their required completion date. Rush arrangements may be made for an additional fee. We charge for shipping tubes and other material and handling fees related to shipping such as Glassine interleave and flat packs. Shipping is billed at cost and can be paid for along with a completed order, or by providing the lab with a UPS or FedEx account number. By doing business with Light Work Lab the client agrees to the following terms and conditions. While we are extremely careful in safekeeping and handling all film, prints, digital files, and client art, submitting these materials to us constitutes an agreement by the client that any damage or loss by Light Work Lab or anyone working for or at our establishment, will entitle the client only to the replacement of a like amount of film, paper, or material used in the production of the original. The client must pick up originals upon completion of the work. The client is responsible for return shipping of work. We are not responsible for any work left in house for more than thirty days. Invoices that include variable work such as hour-based labor may not represent an original job-quote or estimate due to unforeseen factors or changes in the job requested by the client. All large jobs over $2,000 require pre-payment of 50% in advance of the start of the job. We accept personal or business check, Mastercard, Visa, Cash, and money orders. Client will be invoiced upon completion of services and/or shipment of materials. Payment is due upon receipt of invoice. Light Work Lab requires 100% of all materials including files, paper, and negatives by the agreed upon starting date of the job if a specific deadline is discussed. In the instance a client provides the material late to the lab and still requires the lab to meet the initial deadline, a rush fee of %20-%50 using the labs discretion will be applied to the total of the job.